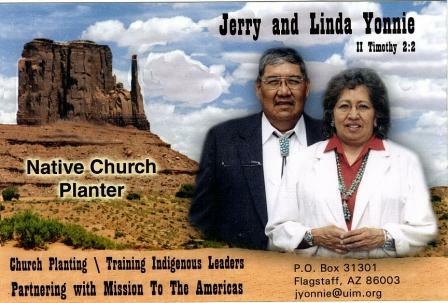 Jerry and Linda Yonnie serve as missionaries with United Indian Missions (UIM) and minister to the Navajo Nation in New Mexico, Arizona, Alaska and Canada. Jerry serves as Southwest US Field Director and has started a Navajo radio ministry called “HE Lives”. Jerry also help nurture two young Navajo churches – Pointed Red Mesa Bible Church in Sanders, Arizona and Dzil Da Zhini Bible Church in Hardrock, Arizona.